Later, I thought about combining that with a memory game, so I created extra cards with equations and pictures only. We sang that song every day for a week. 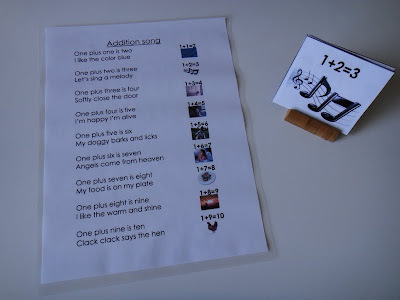 I should say, I sang most of the time until few days ago Eaton asked for an addition song sheet and then he did sing by himself. Although, he was reading lyrics, it was beautiful to see him singing. Here is Eaton few days later singing by himself. And now, I am so proud to say that Eaton sang all equations by himself in the car!! Then I asked him for the equation results and all of them were positive. Although he memorized them I still teach Eaton addition playing with cars. But the song allow us to pass that stage of lack of answers when I asked questions. I would like to share that lyrics sheet and cards with you but I'm still waiting for the approval to use these lyrics from their website. No response so far. Until then I can share only idea and a picture for those of you who like to sing. is that wooden small stand a card holder??? where can i find it?? its slanted angel seems just perfect ! !